How Long Does Patio Furniture Last? The dog days of summer have almost passed and soon we will be covering our patio furniture for protection from the harshness of fall and winter. 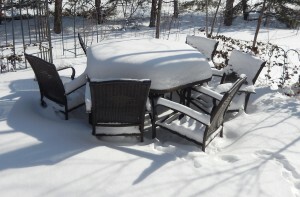 At the end of the season, it’s always a good idea to make sure your patio furniture is still in good condition. You might be asking yourself this question, “how long does patio furniture last?” Here are some good things to know about how to make your patio furniture last as well as hints for purchasing weather-friendly patio furniture. The quality of any product that spends it’s time outdoors exposed to the elements is always important. When purchasing patio furniture, it’s a good idea to invest in quality materials. All-weather and rust-proof products last the longest. If you are looking for pieces that will last through many years, make sure you invest in the right kind of materials. Weather-proof fabrics are a must for outdoor furniture. Sun, wind, and rain can be brutal on fabric that is not specifically made for that purpose. How long does patio furniture last? Longer, if it’s water-resistant! If you are looking to prolong the longevity of your outdoor furniture, it’s important to maintain a certain level of upkeep. This includes making sure your furniture stays covered and dry when not in use. Having your furniture exposed to the elements can encourage mold, mildew, dirt, and rust. Basic upkeep can keep your furniture looking great for many summers to come. Use diluted soft detergent and a soft, bristled brush to gently scrub cushions when needed. Cushion straps are fantastic for holding things in place if you are in a windy environment. If your cushions do not come with straps, Velcro is a great alternative. Vacuum for dust underneath cushions or in the hard to reach spots around the base of your furniture. Make sure your furniture is finished with the manufacturer approved coating to insure it is weather resistant. Micro-fiber clothes are a great tool for keeping things dry. After you are finished cleaning, make sure to wipe down and dry off your furniture completely before you cover. This prevents mold and mildew. How long does patio furniture last? As long or as short as the quality and upkeep you invest in. Basic attention and simple upkeep can make a well-made product last a considerable amount of time. Keeping these helpful hints in mind you can enjoy your patio furniture for many seasons to come.